The concept is that you race another vehicle form a rolling start of around 50klms/hr. You set off from the marshaling point and in the first area before the lights you get up to 50klm/hr, once the lights turn from orange to green you race along the front straight to the finish line about 250mtrs away to see how has the quickest car, then you can return back to the marshaling area and you can race someone else and keep going all night. The secret to Roll Racing is not to have the most HP, biggest tyre or fattest wallet (although all those things help) it’s to have a well set up car that car get the power to the ground and use it correctly. At the Queensland events some of quickest cars there have been 400hp Corolla’s, 500 HP Rotors and VL Commodores who all have extremely well set up street cars, they drive to Roll Racing and drive home, true street cars. Roll Racing is open to all types of vehicles from domestics, imports and super cars all battling it out under lights to see who really has a fast car. The track opens at 6.30pm and we will run as an open track were you can keep coming back and lining someone else up to have another run. Towards the end of the night around 9.45- 10pm we will run an eliminator to see which car is the fastest on the night and invite the 2 cars in the final back for the next event where they will receive the VIP package and be given garage 1 & 2 so everyone knows they are the ones to beat. We limit the number of Roll Racing entries to 150 per night to ensure that everyone gets as many runs as possible. 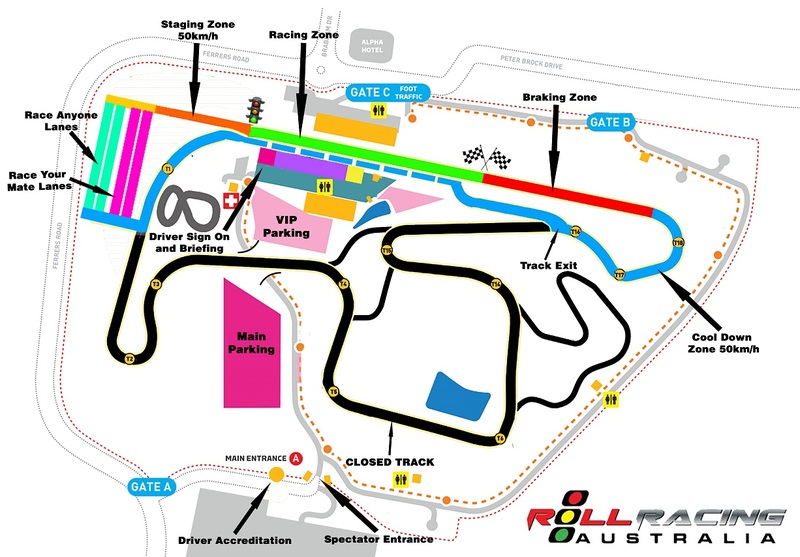 Roll Racing entries are $65 per entry which includes Vehicle entry + Driver Entry + Tunnel access + support vehicle. You also require a RACERS Licence which gives the entrant personal liability coverage under RACERS insurance but does NOT cover your vehicle information on benefits included with your RACERS licence can be found HERE You can get a Day licence for $20 or a yearly licence for $65. Passengers can ride along at Roll Racing and passenger bands can be bought on the day from the drivers briefing area for $20. You will need to sign the waiver and have the same safety gear as the driver, Helmet – enclosed shoes – non flammable neck to ankle to wrist clothing. You will need to be over 18 years of age to ride along as a passenger. If you are entered as a driver in the Roll Racing event you can also ride along as a passenger which is included in your $65 entry fee. Make sure your car is in good working order and fit for the purpose of the event. Make sure that your brakes are in good condition, that your suspension (bushings, ball joints) are in good condition as well. Prior to competing your car will be checked for suitability. Clean out your car interior of loose objects that may move around during hard maneuvering. Fuel, Tyres, Tools, Water bottles, CDs, sunglasses, are all things that could cause issue when Roll Racing so remove them from your car so they don’t get in the way. As part of your entry fee it will give the entrant personal liability coverage under RACERS insurance but does NOT cover your vehicle. Coverage for your vehicle depends entirely on your own insurance policy and you should ask your insurance provider if you have any questions. Generally, insurance companies will NOT cover your car for damage while participating in a Motorsports event.